About a year ago, I woke up one morning in Chicago and realized that another endless day stretched ahead of me. Another day of the same routine, the same monotony, running in the rat race, racing as fast as I could to get…nowhere. Cliche, I know, but I woke up knowing that unless I made a substantial change, I would lose my zest for life. So I reached out on Facebook to an acquaintance who had moved to Colombia a couple of years back. Since she’s a writer and can work from anywhere, she had decided to move to Colombia. I saw the beautiful photos she was posting on social media. I could see she was thriving and living an amazing life. By the end of that week, I’d booked an exploratory flight to Colombia to start what would be the surprisingly fast process of moving abroad and settling down in the popular coastal town of Cartagena, which bustles with international tourists. Within two months, I was settled into my condo overlooking the ocean and thanking the universe. Like my friend, I can live and work anywhere as long as I have internet access. My marketing work for a print company allows me to operate anywhere so long as I meet my goals and deadlines. Maintaining my established business structure in the U.S., I simply paid a friend to watch my PO Box for mail and checks, and deposit the checks a couple of times per month. To keep in contact with colleagues, all I need is to stay in touch with them via email, Skype, or text messages and send invoices as required. On the weekends I jump on a speedboat to visit Rosario Islands, go scuba diving, or simply sit out at the infinity pool at the building where I live (across the ocean, for less than $2,000 a month). If my back hurts from sitting at the computer, I call a masseuse for an hour-long massage that costs me about $10. And if I’m worn down, I can go to a local bioenergetic doctor and spend time in his hyperbaric chamber for the total cost of $30 per treatment. Money talks, as they say, and one of the most attractive reasons I chose to move to Colombia is that the dollar is incredibly strong. In the last 12 months, the dollar has increased substantially, reaching an all-time high. Earning in dollars and spending in pesos is a lovely way to live. My dollar stretches so much more and I’m saving in so many ways given the lower cost of living in this country. For example, instead of spending $100 for a meal out at a restaurant, I spend an average of $30 for a fantastic dinner at incredible restaurants. The people in the coast of Colombia are absolutely enchanting. Full of life, passion, and intensity, they have learned to live life to the max, not allowing themselves to be tied down to the rat race. It’s hard to spend an entire day working when you can look out the window and see people sitting around, talking, and enjoying what ocean living has to offer. 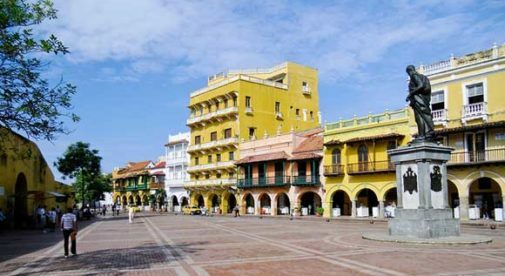 Cartagena is a beautiful city with lots of history, meaning it attracts thousands of tourists from all over the world. Sometimes I go down to the Old Town and meet tourists…and often they remind me of the many benefits of having left the U.S. behind. Do I regret moving to Colombia? Not for a second. Such a graceful exit from the rat race has helped me meet amazing people who have a completely different outlook on life. I’m learning a brand new language, as well as an entire culture. During the days, I sit in my office and work like I would have at home in Chicago. At nights, I get to walk on the beach, meet tourists at salsa dancing clubs, and generally bake in the warmth of the costenos, the name given to coastal Colombians. I wish many more Americans would explore the fantastic opportunity of living here.